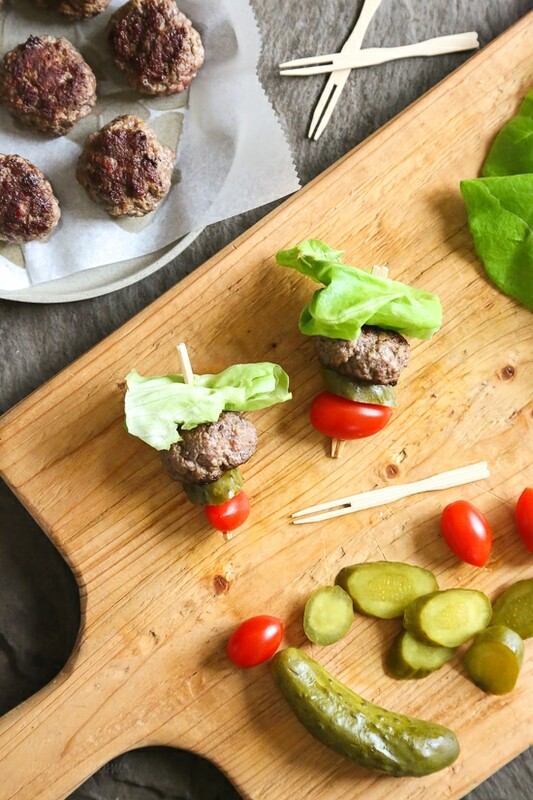 Mini burgers with bacon, layered on a bamboo skewer with lettuce, tomatoes and pickles! Who can resist your favorite foods on a stick – not me! 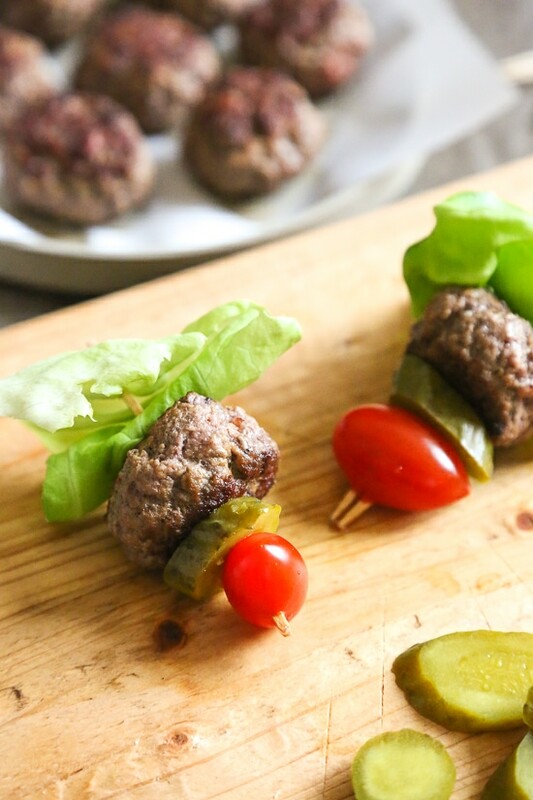 These burger bites make the perfect low-carb appetizer to please everyone from age six to age sixty, just set out some ketchup and mustard for dipping and watch them disappear! More party apps I love are Buffalo Chicken Egg Rolls, Jalepeno Popper “Nachos”, and Baked Sweet Potato Skins. Check out a full list of more Party food ideas. My husband loves bacon burgers, so when I saw these in New York Times Best Selling Cookbook, Danielle Walker’s Against All Grain Celebrations I knew I had to make them! Her book is filled with a year of gluten-free, dairy-free, paleo recipes for every occasion I knew I had to make them! 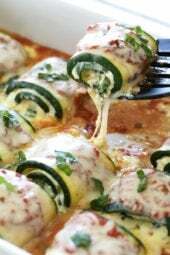 Perfect for the Superbowl for an easy appetizer, or even great during in the warmer months for backyard parties. I slightly adapted them using less bacon and cooked them on my grill pan since it’s too cold to use my grill but you can also make them outside on the grill. 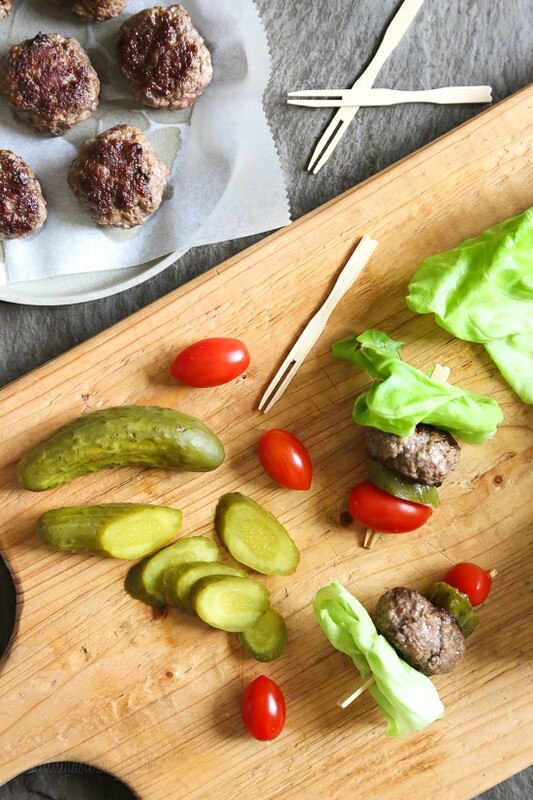 Mini burgers with bacon, layered on a bamboo skewer with lettuce, tomatoes and pickles! Who can resist your favorite foods on a stick – not me! 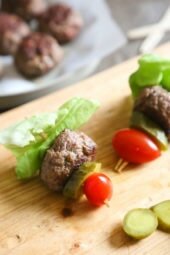 These burger bites make the perfect low-carb appetizer to please everyone from age six to age sixty, just set out some ketchup and mustard for dipping and watch them disappear! Using your hands, gently mix together the beef, bacon, mustard, salt, onion powder and pepper. Form into 30 (golf ball size) meatballs. Heat a grill or grill pan to high heat and grill 3 minutes on each side, or until your desired doneness. 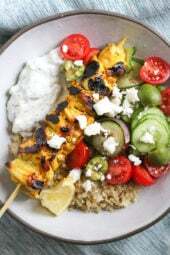 Place on skewers with lettuce, pickles and tomatoes and serve with ketchup and mustard for dipping. 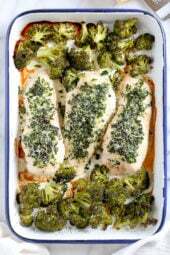 *The meat can be prepared up to 3 days in advance and stored wrapped in the refrigerator. Bring to room temp before grilling. Slightly adapted from Danielle Walker’s Against All Grain Celebrations. Hi! What are the cooking instructions for an air fryer? I am sure you can google? I really dislike mustard. Is there something I can replace it with? When you add these on the weight watchers quick add calculator it comes up as 2 points each Am I doing something wrong??? That’s Smart Points not Points Plus. These were great! I ordered cute bamboo 4 inch app skewers from amazon prime. I baked my meatballs at 400 around 10-12 minutes, didn’t take long. Next time I might add a little more seasoning to the balls, maybe even worsh’ sauce and add bacon to skewers. So so good! ! Making these for the Superbowl! Thanks for sharing!! ???? I love your recipes! Gina, do you have suggestions regarding where to purchase them? Sorry Gina. I meant to say where to buy the small sized skewers. Perfect for Super Bowl! Gina, is there a way to mark or save recipes to a favorites here on your site. Your recipes are the reason for my WW success this time round. Thank you! I have a recipes folder in my bookmarks and just keep my favorites there. GIna, are these good cold? I’m thinking of preparing ahead of time and taking them to a party. Hi Gina, just want to be clear, combine the first 6 ingredients (beef thru salt & pepper) and form into balls? Also, can i bake the meatballs? I’m thinking 15 min at 350? Correct beef, bacon, mustard, salt, onion powder and pepper. Make them in balls and flatten like a burger. I think baking might cause some splatter but you can try! Gina, do all the recipes in your latest cookbook have WW Smartpoints? Or do I have to calculate each one? So this may be a lame question but does the bacon go into the burger with the seasonings? How many patties should this make? I feel like we are missing a direction section here? Sorry for the questions! How do you incorporate the bacon? Are some of the directions missing? The instructions are a little vague. Do you mix the bacon & prepared mustard in with the raw meat & spices?